With many quick loans bad credit is actually not a problem – the loans themselves are the problem. In many cases, borrowers wind up in worse circumstances than they were before they borrowed the money. They are either trapped in an ongoing cycle of debt or left to deal with the loss of valuable personal property (or even a family heirloom). 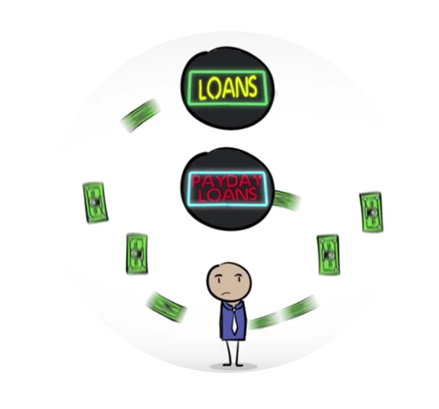 LoanNow is different. Our mission is to provide you with the money you need with repayment terms you can live with. Bad credit is often a self-perpetuating problem. If you have bad credit, merchants and banks often refuse to do business with you. If they do consent to do business with you, it is often on very unfavorable terms. You pay more, you have less time to pay, and you’re given less in quantity than customers that merchants and lenders consider to be more desirable. There is no doubt that if banks offered quick loans bad credit would present a serious impediment – if not act as an absolute deal breaker. Of course, banks do not offer quick loans. In fact, banks are often notoriously slow in processing loan applications. This situation presents a problem for many would-be borrowers with excellent credit, but it’s especially difficult for so-called subprime borrowers. It’s no coincidence that many individuals who have bad credit find themselves in situations where they need money quickly. Many unscrupulous lenders are well aware of this fact and take advantage of it. For such lenders offering quick loans bad credit provides them with a justification to charge high interest rates or to impose predatory lending terms. They know that many of their target borrowers are not only desperate for cash, but have few or no other resources for obtaining funds. Pawn shops offer quick loans for bad credit, but only if you have valuable merchandise to provide as collateral. What pawn shops consider valuable covers a fairly narrow set of categories. Diamond and gold jewelry? Absolutely. Your brand-new iGadget or top of the line laptop? No question. Your collection of Beanie Babies or your really pretty cubic zirconium tennis bracelet? Um, not so much. Pawn shops also lend only a fraction of the value of the property that you’re putting on the line. That tablet you bought for several hundred dollars will likely only be good for a loan well under 100 dollars. Pawn shops also allow borrowers a short window to repay their loans, plus interest or risk losing their property for good. Quick loans for bad credit are a specialty of payday lenders, many of which boast that “your paycheck is your credit.” As it turns out, that claim is true. Payday loans are structured so that it is almost impossible to pay the full amount on the specified due date. Between ridiculously high interest rates and unrealistically short repayment periods, many borrowers are drawn into a trap of rollovers, partial payments, and loan balances that get larger, not smaller, even while they are making regular payments. Quick loans for bad credit occur fairly frequently between friends and family members. That’s because very few such loans involve any sort of credit checks. Instead, the “underwriting” for such loans is largely based on trust and a genuine desire to help. But too often things go wrong. Some borrowers deliberately duck out on their obligations, but others are simply unable to repay what they owe. If the loans are relatively small or the lender is in solid financial shape, unpaid loans may not cause much strain. But in many cases, relationships are strained beyond repair. LoanNow is a different kind of lender. Our mission is to help people improve their financial circumstances by providing the money they need along with education on how to handle money batter. We also recognize that many individuals run into financial difficulty because they lack basic knowledge about how money works. So we provide informative information and blog articles to our customers and to the general public. With LoanNow quick loans bad credit does not automatically disqualify potential borrowers. We look beyond FICO scores to determine an applicant’s overall financial situation. We work with borrowers who run into problems to get them back on track, and reward borrowers who maintain on-time payments with lower interest rates on future LoanNow Loans. Why not experience the LoanNow difference for yourself?